In what may provide a potential path to processing information in a quantum computer, researchers have switched an intrinsic property of electrons from an excited state to a relaxed state on demand using a device that served as a microwave "tuning fork." The team's findings could also lead to enhancements in magnetic resonance techniques, which are widely used to explore the structure of materials and biomolecules, and for medical imaging. The international research team, which included scientists at the Department of Energy's Lawrence Berkeley National Laboratory (Berkeley Lab), demonstrated how to dramatically increase the coupling of microwaves in a specially designed superconducting cavity to a fundamental electron property called spin—which, like a coin, can be flipped. By zapping an exotic silicon material developed at Berkeley Lab with the microwaves, they found that they could rapidly change the electron spins from an excited state to a relaxed, ground state by causing the electrons to emit some of their energy in the form of microwave particles known as photons. Left on their own, the electron spins would be extremely unlikely to flip back to a relaxed state and to also emit a photon - the natural rate for this light-emitting effect, known as the Purcell effect, is about once every 10,000 years. The experiment demonstrated an accelerated, controllable relaxation of electron spins and the release of a microwave photon in about 1 second, said Thomas Schenkel, a physicist in Berkeley Lab's Accelerator Technology and Applied Physics Division who led the design and development of the silicon-bismuth sample used in the experiment. "It's like a juggler who throws the balls up, and the balls come down 1,000 times faster than normal, and they also emit a microwave flash as they drop," he said. The results were published online Feb. 15 in the journal Nature. "Our results are highly significant for quantum information processing," said Patrice Bertet, a quantum electronics scientist at the French Atomic Energy Commission (CEA) who led the experiment. "Indeed, they are a first step toward the strong coupling of individual electron spins to microwave photons, which could form the basis of a new spin-based quantum computer architecture." John Morton, a professor at the London Center for Nanotechnology and co-author of the study, said, "Our ultimate aim is to find a link between quantum information that is fixed and quantum information that can be transported by photons." In today's computers, information is stored as individual bits, and each bit can either be a one or a zero. Quantum computers, though, could conceivably be exponentially more powerful than modern computers because they would use a different kind of bit, called a qubit, that because of the weird ways of quantum mechanics can simultaneously behave as both a one and a zero. A coupled array of qubits would allow a quantum computer to perform many, many calculations at the same time, and electron spins are candidates for qubits in a quantum computer. The latest study shows how the microwave photons could work in concert with the spins of electrons to move information in a new type of computer. "What we need now is ways to wire up these systems—to couple these spins together," Morton said. "We need to make coupled qubits that can perform computations." In the experiment, conducted at CEA in France, a small sample of a highly purified form of silicon was implanted with a matrix of bismuth atoms, and a superconducting aluminum circuit was deposited on top to create a high-quality resonant cavity that allowed precise tuning of the microwaves. The electron spins of the bismuth atoms were then flipped into the excited, "spin-up" state. The microwave cavity was then tuned, like a musical tuning fork, to a particular resonance that coaxed the spins into emitting a photon as they flipped back to a relaxed state. The cavity boosted the number of states into which a photon can be emitted, which greatly increased the decay rate for the electron spins in a controllable way. The technique is much like buying more lottery tickets to increase your chances of winning, Morton said. The large bismuth atoms embedded in the silicon sample provided the electrons with unique spin properties that enabled the experiment. Schenkel said that implanting the bismuth atoms into the delicate silicon framework, a process known as "doping," was "like squeezing bowling balls into a lattice of ping-pong balls." "We did a new trick with silicon. People wouldn't expect you could squeeze anything new out of silicon," Schenkel said. "Now we're looking into further improving bismuth-doped silicon and into tailoring the spin properties of other materials, and using this experimental technique for these materials." To enhance the performance of materials used in future experiments, Schenkel said it will be necessary to improve the doping process so it is less damaging to the silicon lattice. Also, the implantation process could be designed to produce regularly spaced arrays of individual electron spins that would be more useful for quantum computing than a concentrated ensemble of electron spins. 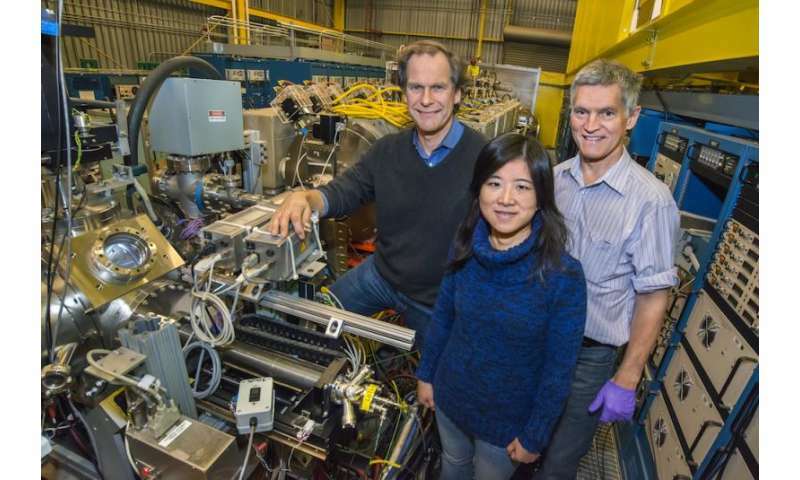 "We are now doing experiments on processing this and other materials at higher temperature and pressure with nanosecond ion pulses at NDCX-II, one of the accelerators here at Berkeley Lab," Schenkel said. "There are indications that it will improve the overall spin quality." Researchers said the latest research could potentially prove useful in boosting the sensitivity of scientific techniques like nuclear magnetic resonance spectroscopy and dynamic nuclear polarization, useful for a range of experiments, and could also shorten experimental times by manipulating spin properties. "You need a way to reset spins—the ability to cause them to relax on demand to improve the rate at which you can repeat an experiment," Morton said. Bertet said it may be possible to further accelerate the electron-flipping behavior to below 1 millisecond, compared to the 1-second rate in the latest results. "This will then open the way to many new applications," he said.